Ground Name: Kassam Stadium Capacity: 12,500 (all seated) Address: Grenoble Rd, Oxford, OX4 4XP Main Telephone No: 01865 337 500 Fax No: 01865 337501 Ticket Office: 01865 337 533 Team Nickname: The U’s Year Ground Opened: 2001 Pitch Size: 112 x 78 yards Home Kit Colours: Yellow & Blue Official Web Site: www.oufc.co.uk About the Kassam Stadium Without a doubt one of the best stadiums in the Non-League, the three sided 12,500 all seater stadium replaced the old and tired Manor Ground in 2001 after a protracted battle to build a new stadium. Theclub were originally due to move out some seasons before but work had to be halted on the new ground due to finance issues, and only restarted when Firoz Kassam became chairman of the club and funded the construction. One of the concessions he made was to only build three stands, although foundations were put it if a fourth stand was ever required. The ground today consists of three seperate stands, decked out with blue seats. 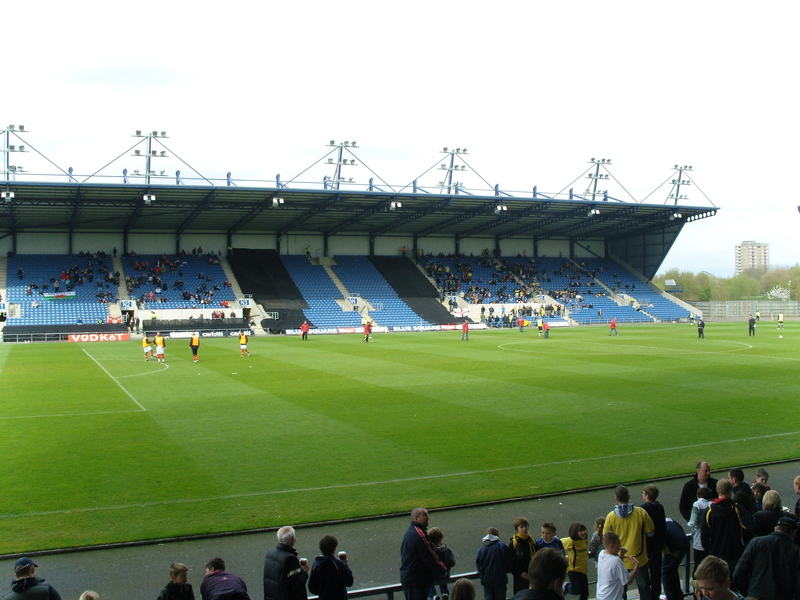 The Oxford Mail (East) and North Stands are single tier ones, with the South Stand two tier, with a row of Executive Boxes in between. The vocal home fans base themselves towards the back of the East stand, whilst the away fans are given the far third of the North Stand. Concourses are wide and have numerous food outlets although they are of the breeze block variety. The club have never filled the stadium, although have on a number of occasions had crowds of over 11,000 (including a record breaking game for the Blue Square Premier in 2006). Unhappy with the way the club were being run last season the fans tried to launch a £13m campaign to buy the stadium but so far appear some way short. How to get to the Kassam Stadium The stadium is located some way out of the city centre, and on the outside of the ring road. It is nowhere near any public transport interchange, and so walking it not really an option. If you are driving head for the Ring Road south. You have two options depending on your direction. If you are heading from south or east (M40 junction eight) then take the exit for Cowley onto the B480 and turn left onto Watlington Road. Follow this until you reach a roundabout and there turn right into Grenoble Road. Continue to follow this until the ground appears on the right hand side behind the Holiday Inn Express. There is parking for 2,000 cars around the stadium available on a first come first serve basis which are shared with the cinema, bowling alley and the bingo, although parking is free. If you are coming from the west or north then follow the ring road until the roundabout with the A4074 (Sainsbury’s is on the far side) Follow the A4074 south exiting at the first junction for the Science Park. Follow the signs for the football ground. A taxi from the station will cost about £7. Buses also run from outside the station to the Science Park. 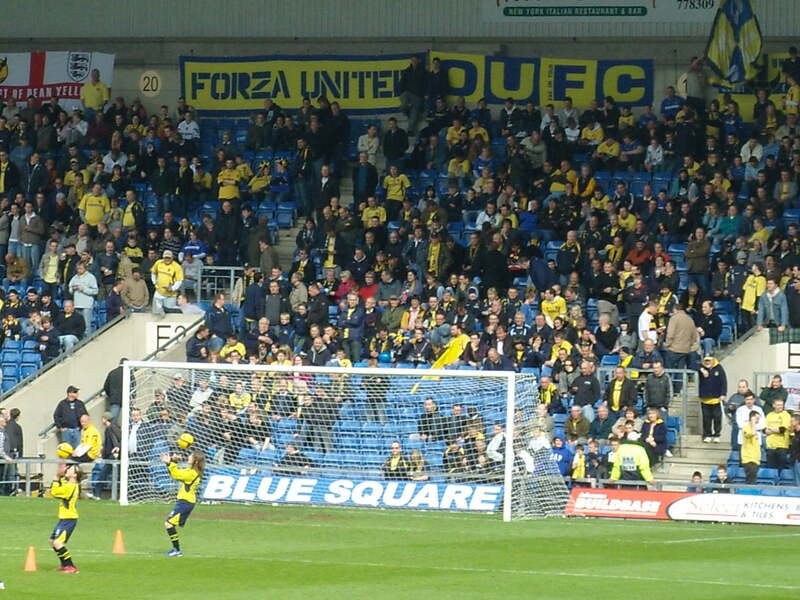 Getting a ticket for the Kassam Stadium Whilst attendances at the Kassam are some of the highest in the Blue Square Premier, they have some way to go before sell outs are a concern for casual fans. Tickets can be bought online at http://www.oufc.co.uk where you can be a £2 discount on match day adult ticket prices. However, you will be charged £1.50 booking fee and a 50p postage charge for the pleasure so if you are just booking one seat it is hardly worth it. On match days tickets must be purchased from the ticket office before going to the turnstiles located next to the main entrance in the South Stand. Prices range from £16 in the East Stand to £22 for a seat in the Upper South Stand. There are discounts for concessions ranging from free tickets (if you book in advance in the family section) to £10. Our Last Trip – Oxford United 1 Wrexham 0 – 11th April 2009 Whilst there is complete truth in the fact that the league tables do not lie, if there was any justice in the world Oxford United would not be preparing to spend a third consecutive year in the fifth level of football in England, otherwise known as the Non-League Conference. Their relegation in May 2007 was seen as a temporary blip in their return to the Championship glory, and the club secured the services of legendary Jim Smith, the manager who took them to Milk Cup glory twenty years previously when a team including John Aldridge and Ray Houghton beat QPR at Wembley 3-0. In being relegated from the league structure they became the first club to have won a major honour to fall into the non-leagues (although they will very shortly be joined by Luton Town).The club have the finest ground in the non-leagues, a stadium that would not look out of place in the Championship, albeit that it only has three sides. It offers all fans an unobstructed view of the action, a decent playing services and facilities galore in and around the stadium. Compare this to Blackpool’s Bloomfield Road or QPR’s Loftus Road and you will see what a decent stadium is like and what a traversty it is that it hosts dozens of away fans from the likes of Barrow and Altrincham (no disrespect guys) instead of Burnley and Coventry City. The relegation has not dampened the support for the club either. Home and away in the Conference the Oxford fans have tried to get behind the team in significant numbers despite some frustrating performances. With just a handful of games left the club sat in 7th place, 6 points off the play off places and rueing the bizarre rules of the Conference that saw them docked 5 points because one of their players who had been at the club a number of years was not on the playing list submitted to the league due to simple human error – fair? I think not. Those 5 points would have put them in the mix for the Play Off places, but it is now a bridge too far. However, the club had vowed not to give up hope and with an impressive home record of 15 wins out of 21 games they could surely rely on the final two games at the Kassam for 6 points. 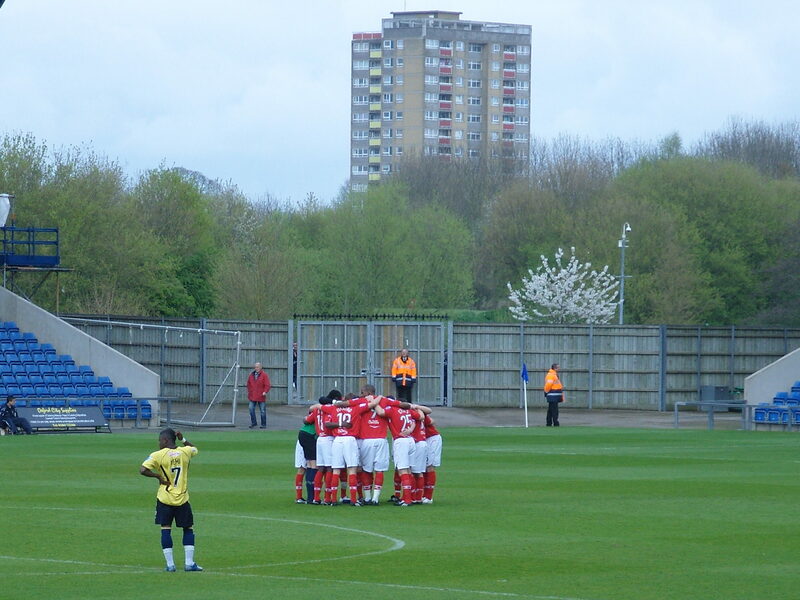 The game versus Wrexham at the start of the season would have been viewed by many as a potential champions decider, but the visitors had found life more difficult than expected in their first season at this level. Manager Dean Saunders is still an Oxford legend, and his return was keenly anticipated by many home fans. They came into the game in 10th place, 5 points behind the U’s and still hoping to finish on a roll that they could then continue into next year. With one club almost already promoted to the league who had never been there before (Burton Albion) and potentially one other via the play offs (Histon) next season would almost certainly be the toughest Blue Square Premier League ever. With Luton Town almost certain to drop to this level with significant funding from Nick Owen’s 2020 consortium, and AFC Wimbledon odds on to come up from the Conference South with their 4,000 season tickets, next season would see almost half of the division with league experience – hardly the easiest division to get out of at the best of times. As part of an “inclusive” family weekend we had headed down to Oxford on Good Friday to do the cultural bits. Christchurch College and the other historic buildings were all visited as well as the modern cathedrals of Starbucks, Next and Game before a night away in the Premier Inn (no expense spared in the Fuller household during the credit crunch). Littlest Fuller had had her fill of football for the season so CMF was on play zone duty whilst Lolly and myself went to the football. As luck would have it, Oxford United is the perfect venue for such eventualities. Next to the Kassam, named after the former Chairman who bought the club when they played at the grotty Manor Ground and built the new stadium on the edge of one of the UK’s top TWOCing venues – Blackbird Leys (for those not up with such hip street talk TWOC stands for Taking WithOut Consent and refers to joyriding), is a “leisure” complex including a cinema, bowling alley, restaurant and indoor play area – perfect for a 5 year old for a few hours. Twenty years ago. the Berlin Wall fell, the SkyDome in Toronto opened and Arsenal won the league by scoring at Anfield with the last kick of the season. I’d rather jack (than Fleetwood Mac – brilliant!) by the Reynolds Girls and Pat & Mick’s I haven’t stop dancing yet were the songs on our lips. Oxford were in the Second Division (still the 2nd tier of English football along with such small teams as Chelsea, Manchester City, Portsmouth, Sunderland and Blackburn Rovers after relegation the previous season from the top flight (and never to return) where as Wrexham eventually finished 7th in the Fourth Division, losing out in the play off final to Leyton Orient over two legs (this was before they were played as a one off at Wembley). Current Wrexham manager Dean Saunders was at the Manor ground at the start of the season but was sold to Derby County for £1m, a move that led to the sacking of Manager Mark Lawrenson (he of the Match of The Day sofa fame) when he complained publically about the short sightedness of the board for selling their best player. Twenty years on and the clubs were meeting for the first time at this level. Saunders had a few more grey hairs and Mark Lawrenson was still publically talking rubbish – only the venue had really improved – thank God. The Manor Ground was one of the worst grounds to visit as an away fan. Tucked away in the suburbs of Oxford with huge fences and CCTV everywhere there was no love lost from visiting fans when the club eventually moved out in the early years of this century. I had visited the new stadium a couple of times, the last being for the Heineken European Rugby Shield Final some years ago when Sale Sharks beat some random crap French team. I was working for (In)Active Matt and my important job was to radio up to the control room when any kicks sailed over the posts at the West (the open) end of the stadium. Whilst it was mid May (actually Cup Final day) it was foul weather, and I had somehow managed to gouge a deep and bloody cut behind my ear in getting out of the car that required stitches from the very pleasant looking (female!) Sale Physio. Not one kick came close to the posts all day and I simply looked like an oversize eager ball boy on the live coverage on Sky Sports 2. The only consolation was that 99% of the sporting viewing public would have been watching the Cup Final and so missed my humiliation. So after an hour or so in the nearby children’s play zone, Lolly and I headed into the ground. The local radio station (JackFM for all your Oxford news!) had been bigging up the game, and manager Chris Wilder had spoken about the need to “still believe”. It is all very well him going public with such sentiments but he really needed to tell the players this as for the first thirty minutes there was hardly a chance. The referee hardly put himself on anyone’s Christmas card list with fussy decision making and with thirty three minutes on the clock he had booked Murray and Constable from the home side, and Flynn from the away team. The best chance of the first half fell to Constable who had just had his shirt ripped open before he took the ball on the edge of the penalty area, skipped passed a defender and rifled a shot just over the bar. Chances were thin on the ground in the second half as well, with Wrexham’s neat passing game occasionally seeming if it would lead to a goal but Oxford held firm. With fifteen minutes to go the Wrexham keeper Neilson injured his hand in a clash with an Oxford player. Cue chaos as firstly the Oxford midfielder had to leave the field to have a stitch in his bleeding head but more significantly the Wrexham keeper could play on no more, and with no substitute stopper on the bench it was one of those moments that home fans pray for – a toss up as to who would be brave enough to take the green jersey and expose themselves to ridicule. The unenviable honour fell to Ashley Westwood who took the gloves and the home fans level of expectations of a game they had to win rose dramatically. For ten minutes Oxford could not get near the goal. And then when they did the keeper threw his fists at any ball that entered the six yard box with great success. It seemed that the game would end up being a scoreless draw but with just two minutes left of the four minutes of added time Oxford United scored the winner as Constable got the goal that his energy and endeavour deserved, heading in via the crossbar from a great left wing cross by Craig Nelthorpe. The goal was met with huge cheers of jubilation and relief on three sides of the ground (well 2 and 1/3rd as Wrexham’s travelling couple of hundred had the other 1/3rd of the North Stand). Behind the Family seating area where we were sitting was an Executive Box filled with drunk (to say the least) chavs who had spent most of the second half tunelessly chanting obscene songs about local rivals Swindon Town. With the goal going in, up went the beer they had been secretly drinking, covering themselves and leading to their immediate ejection by the stewards. What made it all more amusing was their favourite song which they had sung on a number of occasions was about Swindon Town and The Adams Family – trust me if the Adams Family and these morons were lined up together you would struggle to work out which ones were Lurch and Thing! We headed out with barely a minute to go, into the waiting CMF taxi and back on the road home. Not the best of games to end a great couple of days away but I do not think Oxford fans will care. Other results certainly went in their favour with Kidderminster drawing, and Histon losing. If only that form had been filled in correctly back in July!